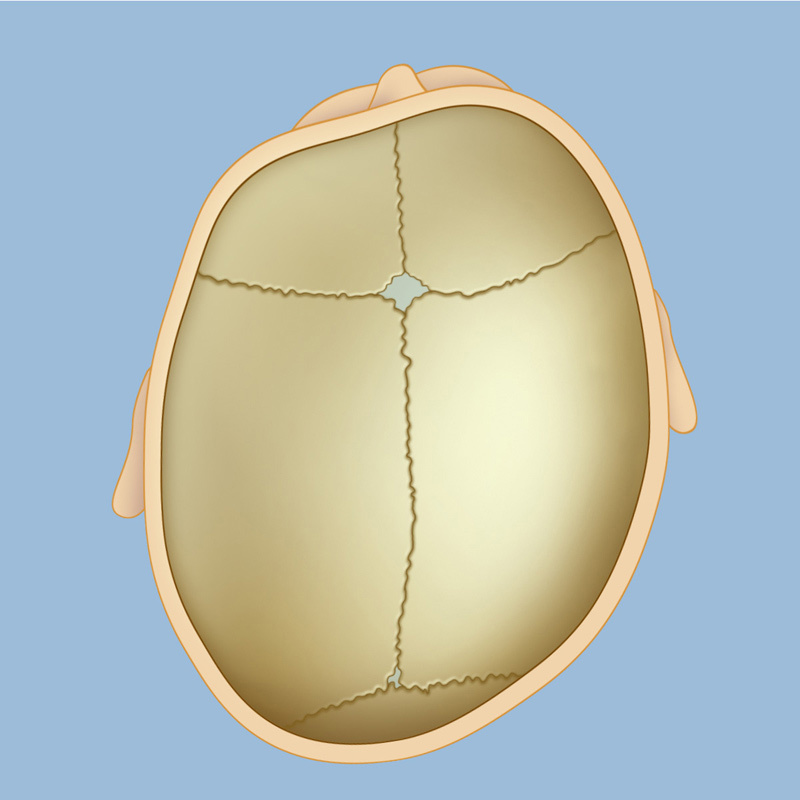 In deformational plagiocephaly, the sutures of the skull remain normal (not fused), but the bones shift in response to external pressure. Deformational plagiocephaly usually resolves on its own and does not require treatment. 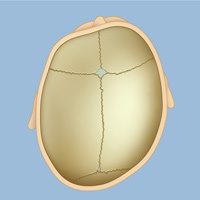 Deformational plagiocephaly, also known as positional molding, is the most common cause of a misshapen skull in infants. Babies with deformational plagiocephaly usually have a flattened head on the back or one side, and sometimes a bulging forehead. Deformational plagiocephaly is not serious, and it usually resolves on its own without any medical treatment. It is not a form of craniosynostosis, which is a skull condition that sometimes needs surgical intervention. Most cases of deformational plagiocephaly occur in babies who spend a lot of time on their backs. In fact, the incidence of deformational plagiocephaly has increased dramatically since pediatricians started recommending that babies sleep on their backs to reduce the risk of Sudden Infant Death Syndrome (SIDS). In most cases, the flattening that is the hallmark of deformational plagiocephaly is simply caused by pressure on the back of the head while the child is sleeping. In other cases, deformational plagiocephaly may be caused by a condition called muscular torticollis, which is present at birth and simply means that one or more of the neck muscles is very tight, causing the head to tilt and/or turn to one side. Infants with muscular torticollis tend to favor one side while sleeping, causing consistent pressure on one side of the head. Premature infants are also at increased risk of developing deformational plagiocephaly, since their developmental progress can be delayed and therefore they spend more time on their back. Deformational plagiocephaly is limited to only the bones of the skull. There is no involvement of the brain and no expectation of any developmental or intellectual delay. If parents have any concerns about their child's head shape and would like to rule out craniosynostosis or other conditions, they may contact our Craniofacial Program to schedule an evaluation. The Weill Cornell Brain and Spine team offers a comprehensive plagiocephaly clinic. This clinic, run by our advanced provider team, provides comprehensive evaluation, management, and treatment for children with positional plagiocephaly. To make an appointment, please call 212-746-2363. Reviewed by: Mark Souweidane, M.D.